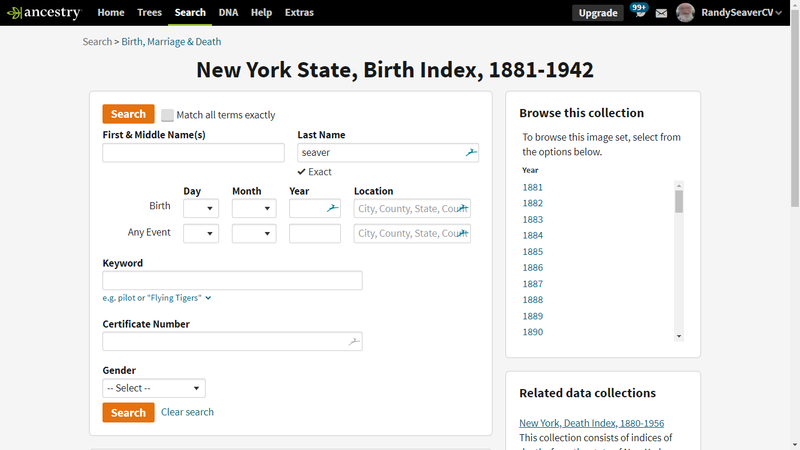 This collection consists of indexes of births from the state of New York between the years 1881 and 1942. The State of New York began statewide registration of births in 1881, under the supervision of local boards of health. The collection contains only indexes to records, but the certificate number can be used to order a copy of the original certificate. Obtaining Copies of CertificatesCertificates may be purchased from the New York Department of Health website, located here. There is not much information on the record summary, is there more on the actual index record? So there is only a surname, a given name, a birth place, a date, and a certificate number. 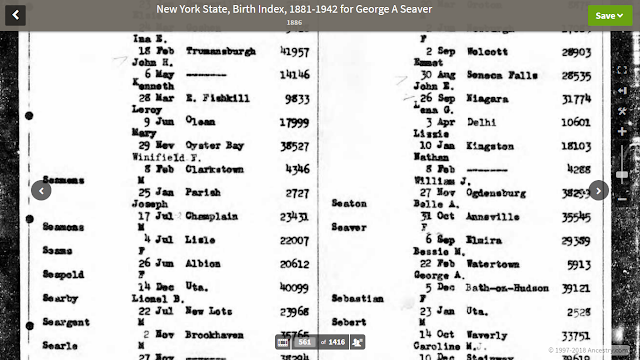 The index is by year, then by alphabetical surname, and then alphabetical by given name (although children without a given name are listed first for each surname). That's not much, but it's more than researchers had without going to Albany and seeing these indexes. So it is progress. To see more information about the birth event, the researcher needs to order the birth certificate using the link provided. 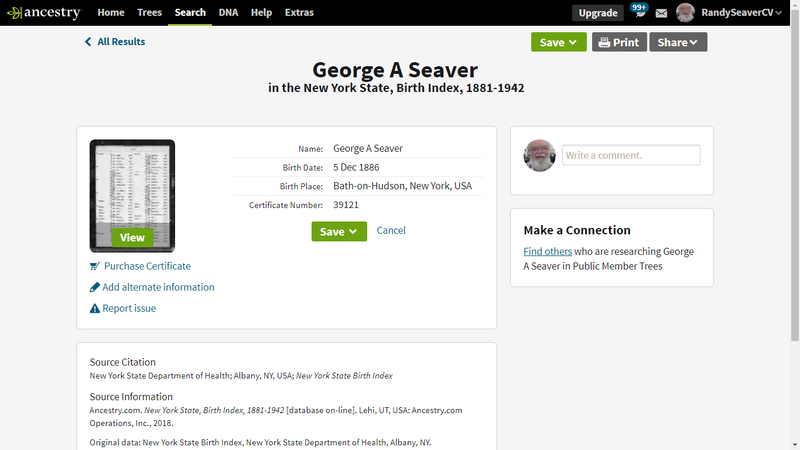 I wonder how soon it will be for Ancestry Hints to appear for this database? 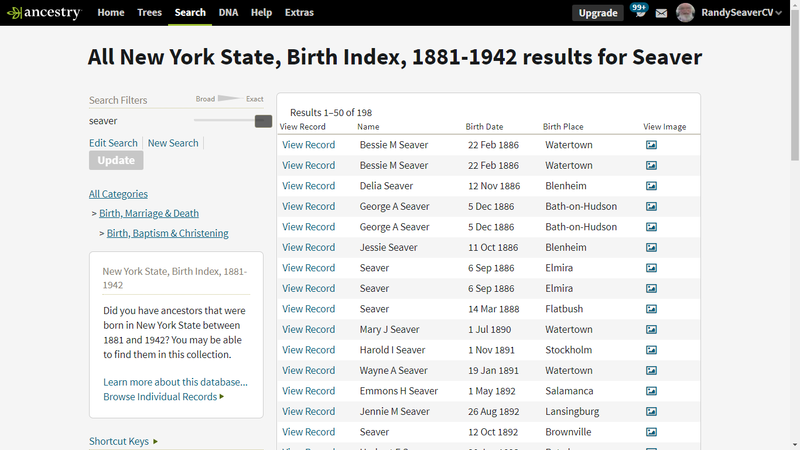 I need to mine these records and add source citations for persons in this database to my RootsMagic family tree, and thence to my Ancestry Member Tree using TreeShare, and to the FamilySearch Family Tree using RootsMagic's FamilySearch Person Tool. Am I related to George A. Seaver? 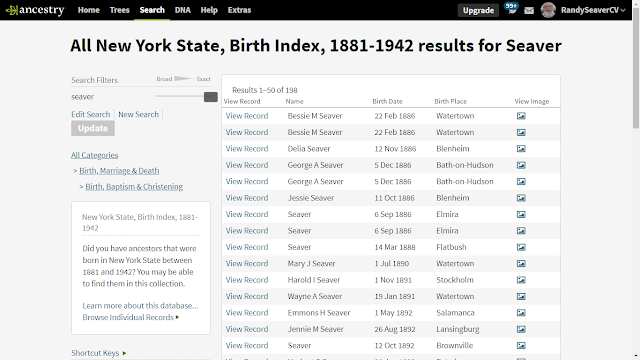 Yep - he is my 5th cousin 2x removed, born George Archibald Seaver on 5 December 1886 in Bath-on-Hudson, Rensselaer County, New York to Joseph Henry and Frances H. (Bennett) Seaver. UPDATED: Thank you to Zio for correction! Bath-on-Hudson is not in Steuben County... that is Bath. Your hamlet is in Rensselear County. Just remember this is the New York State Birth Index, it does NOT include births in New York City (they have their own system). The same, I believe, applies to the cities of Buffalo and Yonkers.